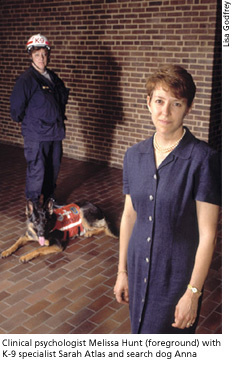 Even before the twin towers of the World Trade Center fell, Sarah Atlas and her canine partner, Anna, a black-faced German shepherd, were deployed by New Jerseys Task Force One Urban Search and Rescue. By the end of the day on September 11, they were at Ground Zero, where they stayed for ten days in a fruitless search for survivors. The [NYFD] people who called us had been killed, Atlas considered as she surveyed the tons and acres of wreckage. Nobodys going to be alive. Fires burned and molten steel flowed in the pile of ruins still settling beneath her feet. She wore a respirator to filter out the smoke, dust, and fumes, but Anna worked without a mask to sniff out places where the broken dead lay. Anna is a live-find dog, but she developed a truly intent stare that Atlas came to recognize as her response to catching the scent of a corpse. Mostly they found parts. These dogs were exposed to huge amounts of known toxins and unthinkable amounts of unknown ones, says Cynthia Otto, an associate professor in the vet school. Otto is leading a three-year study of the dogs, funded largely by the American Kennel Club. But its not just the animals. The handlers may have worn masks and respirators but that doesnt mean they were completely protected. When she returned to her home in New Jersey, Atlas began having nightmares, couldnt remember things, and struggled to find wordseven to just say hello. I couldnt find my house, she recalls, and when I pulled into my driveway the burgundy [walls] hurt my eyes, because all we saw for ten days was gray. Soon after, she was hospitalized with pneumonia and later diagnosed with Post-Traumatic Stress Disorder (PTSD). Melissa Hunt, G90, Gr96, associate director of clinical training in the psychology department, was delivering a talk at the vet school about some research shed been doing on people whose pets had died. Otto approached her after the lecture and invited Hunt to sign on to monitor the emotional health of the dog handlers. The studys findings are preliminary, and any long-term reverberations are only just beginning to be felt. I think what were going to learn from this study is a lot about human vulnerability and human resilience, Hunt affirms.